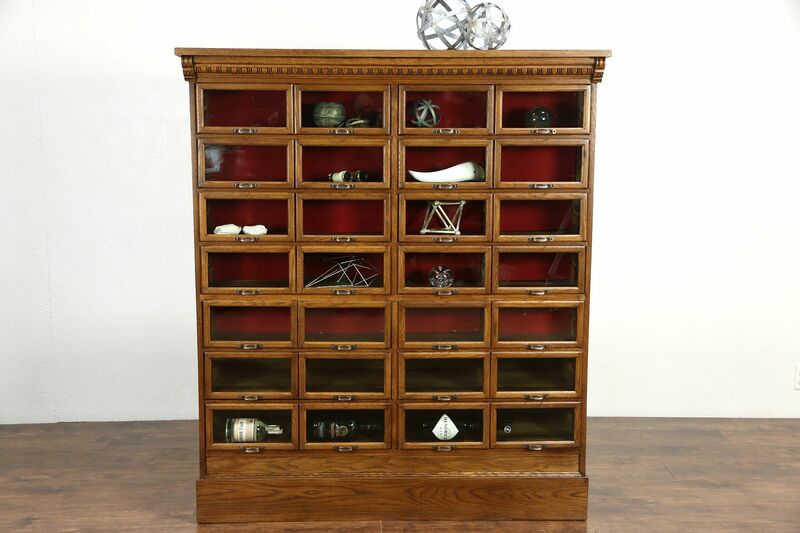 Signed by J. D. Warren Co. of Chicago, this solid oak 1900 era file cabinet has 28 glass front drawers. The deep brown restored finish is in excellent condition. Made for a Minnesota drug store, this remarkable antique store furniture is useful for crafts or collections. Drawers have old wavy glass drawer fronts. All but the bottom two rows have patented adjustable felt covered dividers to display the contents behind the glass window. Original rose brass pulls are signed "Warren" and there are still labels on the sides for the contents. Interior measurements are 10 1/2" wide, 12 1/2" deep and 5" tall. The base has been rebuilt. Overall dimensions are 52 1/2" wide, 18" deep and 60 1/2" tall.